Our Alaska Gold Maps are so large they have to be divided into four separate maps based on Alaska’s meridians: Copper River, Seward, Fairbanks, and Kateel River. 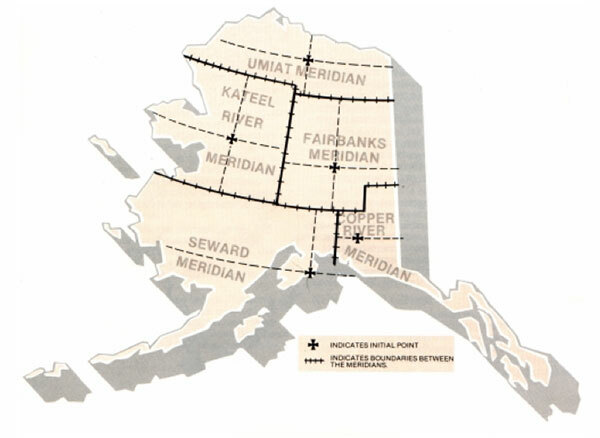 Alaska’s fifth meridian, Umiat, is located in the extreme north of the state and has no gold claims that we could find. To our knowledge this is the most comprehensive set of Alaska Gold Maps in existence—to include state and federal gold claims. Each gold map contains four sub-maps: One active state claims map, one abandoned state claims map, one active federal lode map, and one active federal placer map. Abandoned federal claims data for Alaska doesn’t exist at this time—but we’re working on it. Unlike the lower 48 where most gold claims are located on federal land, roughly 85% of Alaska’s gold claims are located on state controlled lands—and are registered as state claims. Our combined state and federal Alaska Gold Maps show there are currently 46,730 active gold claims, and 11,965 abandoned gold claims located on state lands—and 7,776 active lode and placer claims located on federal lands. All told, Alaska contains 54,506 active gold claims—that’s a whopping 12.4% of all gold claims in America.